We take a lot of aspects of our vision for granted. We expect to see nearby and faraway objects clearly, even if we require our eye care provider to prescribe eyeglasses or contact lenses to do so. A huge degree of the information we take in about our world and our surroundings takes place visually, yet we rarely recognize and appreciate the fact. Finally, as adults we blink on average 10 to 15 times per minute or over 16,000 times during an 18-hour day. Despite all the mechanical action involved in blinking, moving one’s eyes to follow a moving object, or even focusing our eyes to see a small object, most of us rarely experience eye pain. Thus, when we do experience eye pain, it is an extremely frustrating event, despite the magnitude of the pain we may feel. The pain may limit our ability to see, read, walk, watch TV or conduct many of the activities of daily living. Eye pain or irritation can come from a variety of sources. Sand or grit blown into one’s eyes can cause significant discomfort until the particles are rinsed out with a neutral eye solution. The vapor of some harsh chemicals can also cause eye irritation, particularly if used in enclosed spaces. Tear gas is an example of a chemical designed to cause severe eye irritation, overactive tearing as the eyes attempt to wash the chemical away, and involuntary eyelid closure to avoid additional exposure to the irritant. An optometry evaluation may be necessary under these circumstances to help treat the exposure and prevent permanent damage. “Snow blindness” or “flash burns” — the eyes’ equivalent of a sunburn — can occur when we expose our eyes to bright sunlight or extremely bright lights without the protection of ultraviolet sunglasses. Just like a sunburn, the eyes may require two to three days to recover. Treatment for photokeratitis usually consists of cool compresses to the closed eyes three to four times per day, an over-the-counter anti-inflammatory medication by mouth and plenty of fluids. Like a sunburn affects the skin, photokeratitis can cause long term damage to one’s visual health. 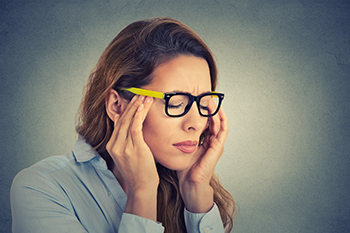 Some neurological conditions — such as migraine headaches, cluster headaches or trigeminal neuralgia — can also appear with primary symptoms of eye pain. See your eye care provider if these symptoms persist or if you are experiencing frequent or ongoing eye pain.